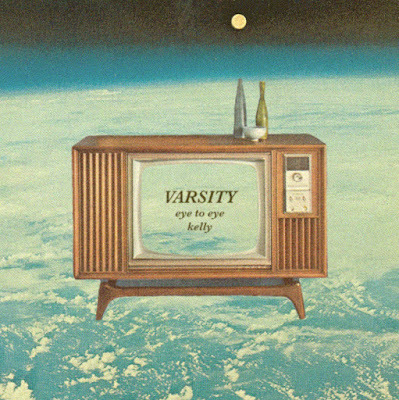 Varsity delivers signature pop hooks with rich melodies on “Eye to Eye" and "Kelly”. Chicago-based band Varsity slathers honey over each of their songs and lets them drip-dry in the sunshine. Building upon the high-energy blitz of earlier releases, the band crafts songs that are consistently hooky and endearing on their latest digital single. In my second semester of college sophomore year, my friends and I started making mixtapes for each other, compiling our favorite jams and soaking up each others' new sounds. My favorite mixtape I received was titled “Spring Time” and it became my first introduction to the pop melodies and unshakable hooks of Varsity. It's fitting that Varsity would land on a spring playlist, as their songs are fun and catchy, like the start of the season when all you want to do is lay in the grass and eat popsicles with your best friends. Even with the first listen, these songs are extremely addictive and will leave you sweetly singing along to every word through springtime right into summer. Varsity’s music tackles a variety of themes including nostalgia, ephemeral friendships, and a melancholic love. Their two-track single “Eye to Eye" / "Kelly” effortlessly shifts from upbeat to a more contemplative sound. “Eye to Eye” is a pure pop song that sounds ultra-light and triumphant even as it works through harder feelings. Vocalist Stephanie Smith's lyrics soar as she sings, “I wake up / Space out / Wondering if it was my idea to pass out a handout / Isn’t that just like me.” The song tackles those weird in between moments of drifting and moving out of a relationship. Smith narrates her internal struggle to reconcile love and her personal needs, “You’re up in my zone, keeping myself company, I can’t stand to go home.” The song ends with a tale of not quite being able to let go with an empowered yowl, “Was I really so wrong not to let you go / but I turn on myself.” Varsity delivers vulnerable lyrics with maximum emotional force; the choruses soar like power pop, but are subdued by tempo and fidelity. The B-side track “Kelly” echo’s the complex situation of confronting a friend with honest truth, even though they don’t necessarily want to hear it. Soaring keyboard melodies and warm distorted guitars take the song back to sixties with a comparison to pop bands like The Shangri-Las or The Paris Sisters. While the single may be short, it’s the perfect soundtrack for getting ready to go out, taking your dog for a walk, or having a solo dance party while waiting for your train to arrive at the station. Sometimes you want a pop song to untangle complex feelings and help to figure out what ails you and other times you just want to dance and have fun. For either occasion, Varsity is there, delivering pop songs that are meant to stick in your head and slam into your heart. Listen to Varsity on bandcamp.